Please see all the pictures for fabric and font choices. The 3rd picture is shown with fabric that has small white flowers in with the leaves. 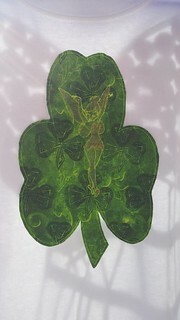 This shirt would be great for St. Patrick's Day, anyone who loves fairies, and also perfect for Irish Dancers. Contact me with spelling of your name and font choice. No refunds for personalized items. Please allow 2 weeks for this item.